There are several ways to fix the issue in different situations. We have not determined what the common thread is with each of these. It is possible that there are several different issues that are occurring, depending on the version of QuickBooks involved. So far, all problems seem to happen with Windows 10 installations that are new. The Web Connector application must have been installed and run with standard user permissions, not elevated to run as Administrator. Keep in mind that the first time that you run the Web Connector, you must have the QuickBooks file open using the Admin user account, so that the Admin can give permission for the application to access the file. Make sure that you don’t have any dialog box open in QuickBooks when you run the Web Connector application. These are windows in QuickBooks that don’t allow you to do anything else until you close the window. Editing preferences, for example. Or one of the many popup windows that QuickBooks may throw your way. Make sure that the general preference Keep QuickBooks running for quick startups is not enabled. If it is, uncheck the box and reboot your computer. 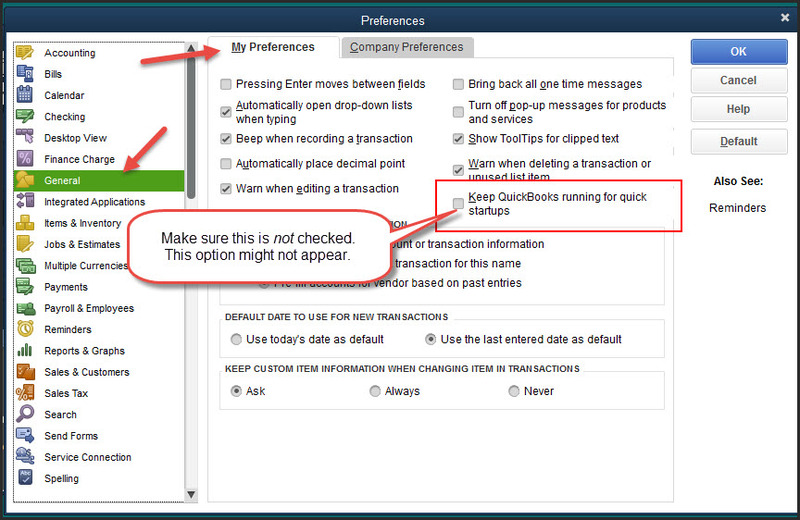 Note that Intuit is removing this option from currently supported releases, so you might not find this option. It caused a lot of trouble. Solution 1. We had a new installation of QuickBooks, and then installed the Web Connector product. Sometimes new installations don’t start up all QuickBooks services properly. For our test system, the simple solution was to exit QuickBooks, make sure that the Web Connector product wasn’t still running in the background, then restart QuickBooks and try again. 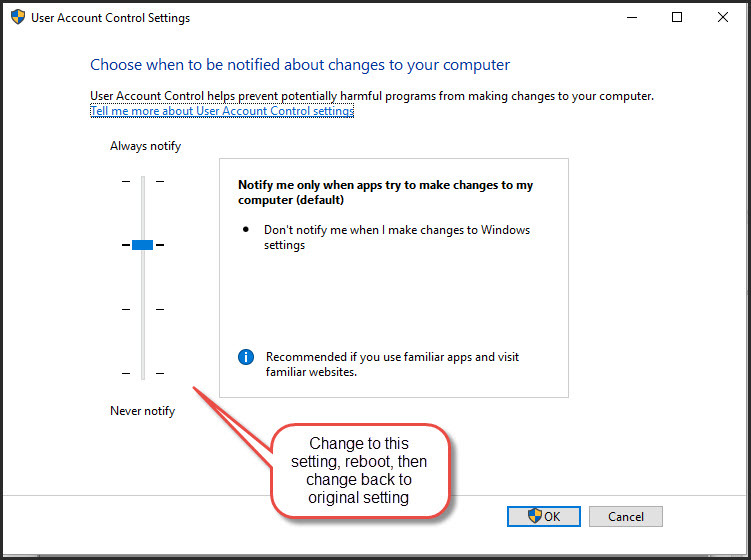 Solution 2 involved turning User Account Control to the lowest level, rebooting the computer, then turning User Account Control back to the normal setting. This has resolved the problem for some users. Solution 3. Uninstalled the Web Connector, “clean the registry” using a product called CCleaner, and then reinstalled. That may resolve the issue. It is important to note that in the past, with different QuickBooks installations that have been updated multiple times, “cleaning” the Windows registry by some method has often resolved odd problems. However, you have to be careful with this kind of thing.